The currency market is the place where traders of all types come to speculate on the world’s currencies moves. Retail traders, have little or no influence in this vast market. Also known as the interbank market, the foreign exchange market is a decentralized entity, regulated only in some parts of the world. The players that make its colossal volume (about five trillion dollars each day) belong to a category retail traders just dream of. For instance, an active player on the interbank market, like a hedge fund or investment bank trades over five million dollars on every transaction, and sometimes the amount is more than hundreds of millions or even more. This can be both speculative and physical. You understand now the potential of the FX market and why retail traders are attracted to it. Brokers made it easy to access this huge liquidity pool by intermediating the process. In exchange for a fee or commission, brokers provide leverage so that retail traders can buy and sell currencies at the same table with professional investors and global financial entities. Only reading the paragraphs above gives you an idea where the chances of winning lie. Armed with research departments and more significant financial resources than any retail trader can pull at any one moment in time, the big market players call the shots on the FX market. However, retail trading is not a lost cause. Just the opposite. By understanding the market, both from a technical and fundamental point of view, retail traders can align their interests with the big players. That is the moment when the retail market can start profiting from FX moves. In other words, by educating themselves and understanding what moves the currency market, the retail traders slowly but surely, rise to the bar set by big players. From that moment on, the road to profitability is open. One of the first concepts to deal with in any market, including the currency one, is the difference between a bullish and bearish environment. Moreover, technical analysis is full of bullish and bearish patterns, like bullish and bearish pennants/flag patterns, that make it easier to align on the right side of the market, where the big players sit. The price action on any financial product is split into bullish and bearish sentiments. Effectively, the two words signal a bullish and bearish market. The names come from the animal world. 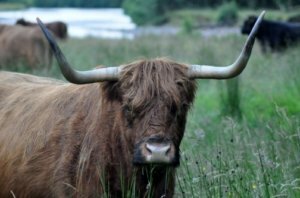 The horns of a bull always point to the upside, hence showing a rising market. As such, bullish means the market is on the rise, and traders look to buy dips in the bullish environment, to profit from higher prices to come. On the other hand, bearish comes from the bear that walks with its head pointing to the ground. Or, to the south, meaning lower prices or a bearish market is in place. Hence, bearish and bullish markets refer to the price action of securities when it moves to the downside or to the upside. Also when bulls attack they hit upward and when bears attack they hit you down. The difference between bullish and bearish markets lies with the traders’ expectations. In a bearish market, traders expect prices to fall. They’ll position accordingly and take advantage of all the opportunities to sell short (selling the price of a currency pair or stock with the intention of repurchasing it from lower levels – the difference represents the profit). By going long, traders express a bullish sentiment. They expect the price of a security to rise, and when closing the trade, the difference represents a profit. In other words, the trading environment always shows a battle between bullish and bearish expectations. In traders’ jargon, bulls and bears fight for every level, every inch on a chart, and only the most powerful ones prevail. Now that we solved the riddle of where bullish and bearish come from in trading, we can’t move on without explaining the central banks’ jargon for the two terms. Central banks or central bankers, can’t provide bullish and bearish signals. Their mandate won’t allow it; it is illegal. Instead, central banks are hawkish or dovish. Again, the terms come from the animal world, with the hawk flying up in the sky, and the dove much lower. In other words, hawkish and dovish central bank statements are the equivalent of fundamental bullish and bearish indicators. Also, a TV interview or an article in a newspaper that refers to an opinion of a central banker is not bullish or bearish, but hawkish or dovish and in some cases neutral. In the United States, things go even further. When the FOMC (Federal Open Market Committee) minutes are released (three weeks after the FOMC Statement), traders scrutinize them to see the balance between doves and hawks part of the committee. Effectively, they check to see if there is a change on the hawkish/dovish balance, as this would immediately translate in a bullish or bearish reaction in the financial markets. Many traders wonder, what is a bullish and bearish market and when it is best to trade securities? Technical analysis will help to solve this riddle as it deals with pattern recognition based on historical price action. A bullish and bearish chart provides patterns that traders use to profit from the bullish and bearish trends. Pennants and flags are such patterns. They represent consolidation patterns and always break in the direction of the underlying trend. For this reason, they are called continuation patterns. Tellingly, the price builds energy before breaking higher in a bullish trend, or lower in a bearish one. Consolidations often form on the currency market, and not only. Sometimes, the market players wait for a critical economic release and other bullish and bearish signals to open new positions. Different trading sessions also have different volatility levels. The Asian session, for instance, is very slow, with the markets mostly consolidating, expecting for the London session to start. In time, traders documented these consolidation areas and set rules to trade them. As such, bullish and bearish pennants/flag patterns appeared. A pennant is a triangular formation that forms in the middle of bullish and bearish phases in any currency pair or another market. The price builds energy to break higher or lower, and it takes a bit of a time until it explodes in the direction of the underlying trend. 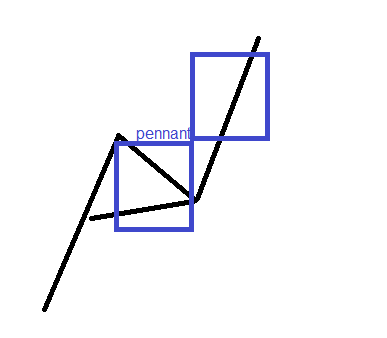 The image above shows what a pennant looks like. In this case, it is a bullish pattern. The market is on the rise, but takes a pause and forms a triangle. After the triangle breaks higher, the pennant completes, and traders shift the focus to the measured move. Bullish and bearish pennants/flag patterns belong to the classic technical analysis patterns. All such patterns have a measured move, or the distance the price must travel to confirm the pattern. If the price doesn’t reach the measured move, the patterns is simply invalidated. That’s the beauty of technical analysis: it leaves no room for error when interpreting bullish and bearish patterns. While almost all measured moves relate only to the distance the price must travel, in the case of a pennant, traders also consider the time element. First, traders measure the distance from the previous consolidation area until the triangular formation. Or, until the pennant. Next, they project it from the upper side of the pennant (in a bullish market). That is the measured move. 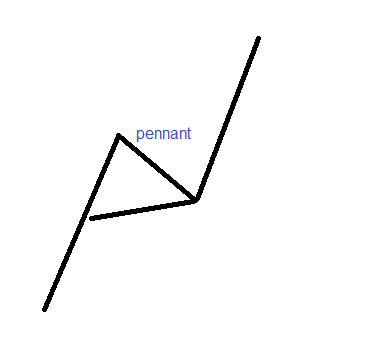 Finally, traders measure the time taken for the pennant to form and project it on the right side of it. The measured move must come in less or the same time taken for the pennant or triangular formation. If not, and time expires, traders close the position. As such, pennants are responsible for both bullish and bearish positions (depending on the type of the market), and traders consider both price and time when trading such patterns. The difference between a pennant and a flag comes from the consolidation area. While pennants form a triangle (typically a symmetrical triangle characterized by short consolidation time and powerful breakout), flags form a horizontal area or a consolidation area that goes against the main trend. For instance, the chart above shows the recent EURUSD daily price action. It shows the dominant bullish trend during 2017 and the toppish formation in 2018. However, in the middle of the rising trend, the market formed a bullish flag. As you can see, the flag or the consolidation area isn’t horizontal, like in the case of bullish and bearish pennants. Instead, it goes against the main rising trend, until it eventually breaks in the same direction. The measured move here respects the same rules as the ones in the bullish and bearish pennants, including both price and time. They move until the flag’s consolidation is called the flag’s pole. As mentioned earlier in the article, bullish and bearish pennants/flag patterns belong to classic technical analysis. Also known as the Western way of doing technical analysis, it has significant competition from the other side of the world: Japan. The Japanese candlestick patterns and techniques are known to exist for about three hundred years. Inventive traders in Japan kept count on the price of rice futures using candlesticks patterns. Nowadays, every trading platform offers candlesticks charts, and they quickly became the favorite among retail forex traders. It turned out it was just a matter of time until traders discovered bullish and bearish candlestick patterns the Japanese traders used. Among the most potent Japanese patterns are the bullish and bearish candle patterns, the hammer and the shooting star patterns, the dark-cloud cover and the piercing indicators, as well as the Doji candles or morning and evening stars. But because the candlestick chart proved to show a more precise picture of the Western classic technical analysis patterns, traders favor them when interpreting the patterns. We can say that bullish and bearish classic patterns appearing on candlesticks charts are the head and shoulders, ascending and descending triangles, double and triple tops and bottoms, round tops and bottoms, cup and handle, and so on. What matters here is to understand that since the candlesticks charts appeared, technical analysis changed forever. Traders use a combination of Japanese candlesticks patterns and classic Western patterns to ride bullish and bearish stocks, currency pairs, bullish and bearish options, or to tell the difference between bullish and bearish trend conditions. As part of classic technical analysis patterns, bullish and bearish pennants/flag patterns show the path of least resistance for the future prices. Combining both price and time when trading the two patterns, traders gain a competitive advantage in the extreme volatile currency market. Bullish and bearish markets represent the bread and butter for a speculator. Neutral or ranging markets present more challenges. Technical analysis is full of trend indicators and oscillators, as well as patterns and trading theories, to deal with all market conditions. Oscillators, for instance, are suitable for range markets, while trend indicators for trending ones. The key is to combine them all to identify bullish and bearish market conditions. Moreover, having a clear understanding of market fundamentals helps. All in all, technical trading is made out of continuation and reversal patterns. Now you know what bullish and bearish pennants/flag patterns are, as well as other ones belonging to Western and Japanese approaches to technical analysis. In the end, it doesn’t matter what indicator or pattern a trader uses. The most important thing is to end up on the right side of the market by using a disciplined approach to trading. 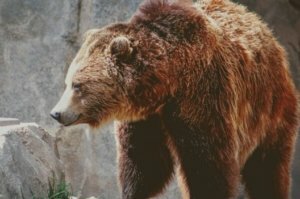 What Are Bearish and Bullish Pennants?